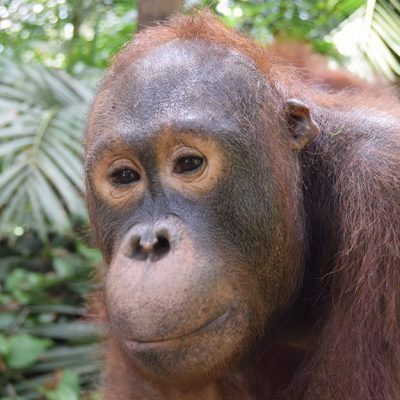 Every year courageous men and women seeking adventure and a challenge in the name of helping orangutans sign up for Orangutan Foundation International’s (OFI) three-week construction volunteer program. These eager men and women assist in maintaining and constructing vital structures at OFIs field camps in Kalimantan Tengah, Central Borneo, Indonesia. This year OFI was fortunate enough to have two construction teams travel to Indonesia to assist with maintenance and construction work to support our field operations. Both teams arrived in Central Kalimantan this year not knowing exactly where they would be based during their three-week volunteer period. We at OFI, however, knew that this year both teams were in for a great surprise! 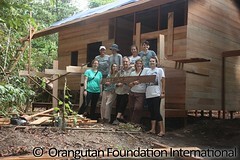 They would be helping us rebuild the research staff team housing at Camp Leakey. The excitement was palpable when the teams found out where they were going to be based during their three week volunteer period. They found out only after they arrived in Kalimantan. Any time spent in Camp Leakey is always treasured. 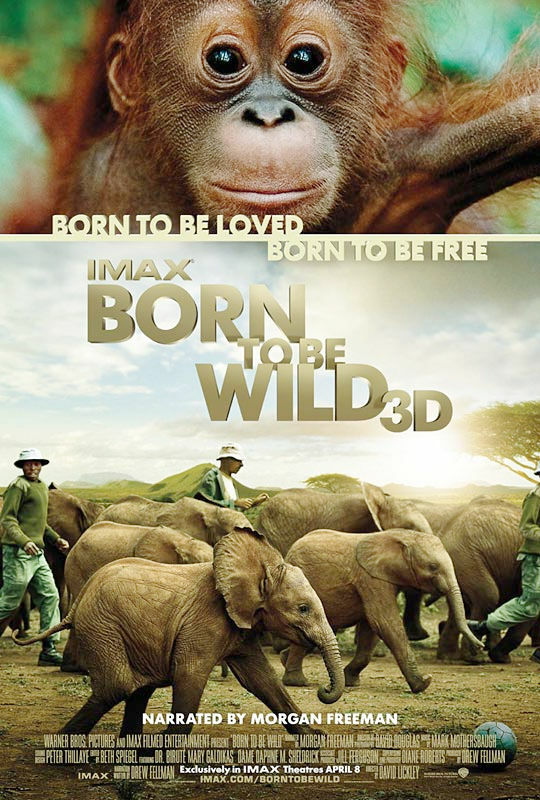 It had been several years since there was a group of volunteers living at Camp Leakey. The volunteer’s first job was to fix up their “own” building called the “Team House” where they would be staying. 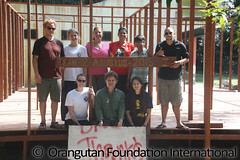 This building has been the home to many researchers, volunteers, and even orangutans over the years. 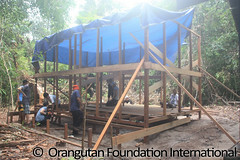 It required extensive patch work to make it orangutan proof. Team One enjoyed the job of finding new parts to fix each day. As some of the Team were doing this, the rest started on a new building intended just for student researchers. 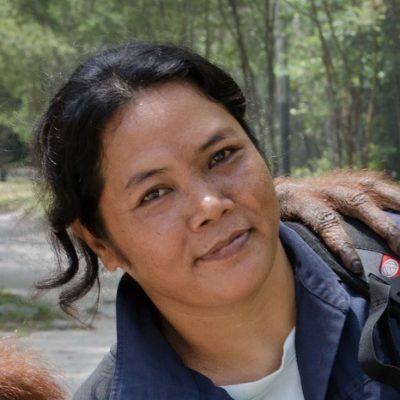 This important housing will facilitate OFI’s hosting of local Indonesian students and researchers who will investigate the incredible biodiversity of the forests of Tanjung Puting National Park. Team Two arrived just in time to start the rebuilding of one of the current staff buildings. Before starting the construction of the new staff house, Team Two had to demolish the old building. This took a number of days. The team went on to construct over 170 footings made from ironwood for the new house. Ironwood is incredibly strong and thus, this work was very laborious. At the same time other members of the team and staff also completed the roof that Team One had begun on the new staff house. The team installed over 5,000 ironwood shingles! The new staff house was a big project. Team Two made a significant start on it but didn’t have the time to finish. The house is being finished stages right now by local carpenters. The staff are eagerly waiting to move in! The teams had their ups and small downs, as can be expected when a number of strangers go to live and work in the remoteness of Borneo. However, thanks to OFI’s 2015 Construction Volunteer Coordinator, Michelle Curtain, both teams made it through the weeks of heat, drought, insects, and exceptional hard work happy and healthy. A big thanks to Michelle! 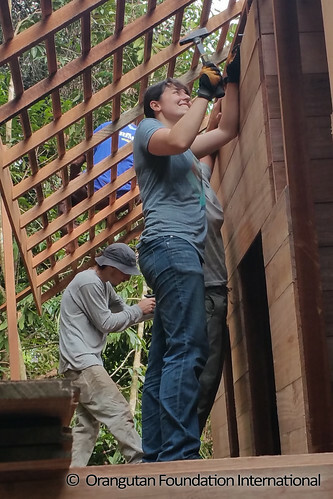 On behalf of all of the staff and orangutans at Camp Leakey, OFI would like to thank all the construction volunteers this year for their work, contribution to the activities of OFI, and assistance in protecting orangutans and conserving rainforest. Not forgetting Iyank from Jakarta who did an awesome job in team two!